Few sights look cuter than a small boy or girl dressed up and carrying your rings to the altar. Wedding ring pillows have been popular for a while now in America, but we can do better! The designs here are in silk, but could equally be made in satin, velvet or printed cotton fabrics. I have incorporated embroidery, lace, vintage or new crochet, big blousy flowers - you will have your own ideas. Many are, by their very nature, one-offs and can't be repeated. All designs have two little ribbon loops to keep your rings safe on their way to your fingers! If you look back to the bouquets and posies, you will see how they can be teamed with your chosen colours, though please note if you want vintage crochet decoration, it only comes in the colours it's in - like buying an antique ring, the colour is the colour! However, any other embellishment - ribbons, buttons, beads etc - can be in a multitude of colours. 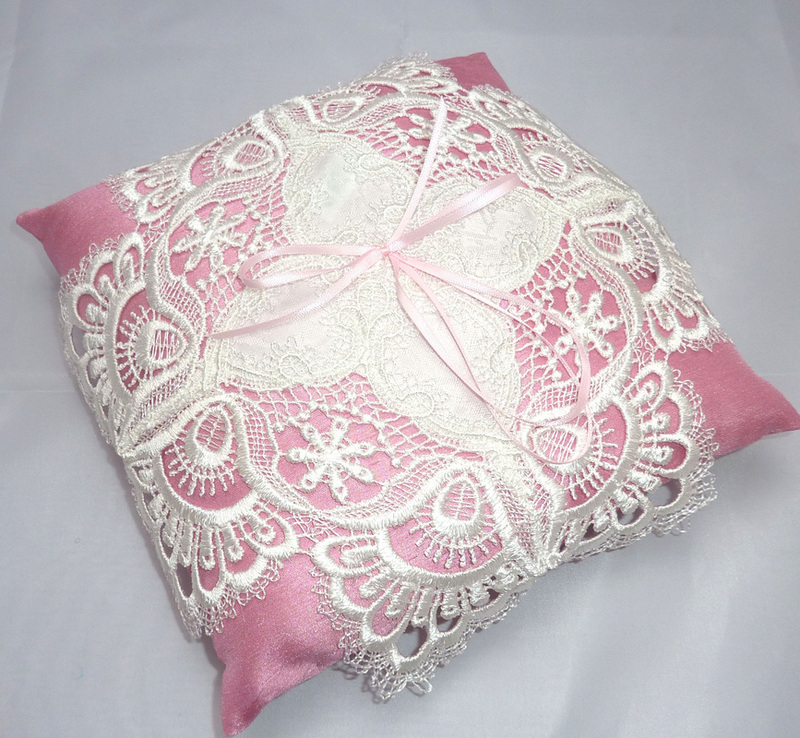 Just think how pretty these pillows would look on your bed as a constant reminder of your special day. If you would like a Ritzy Crystals 'bug' added, these are extra but the price will be discounted from the listed price on the 'vintage and bling' pages. 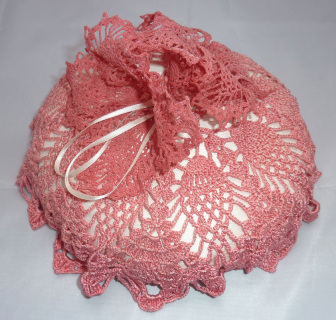 This little ring pillow is about 6ins across, and covered in a white vintage crochet doily with a pink crocheted flower in the middle on both top and bottom. 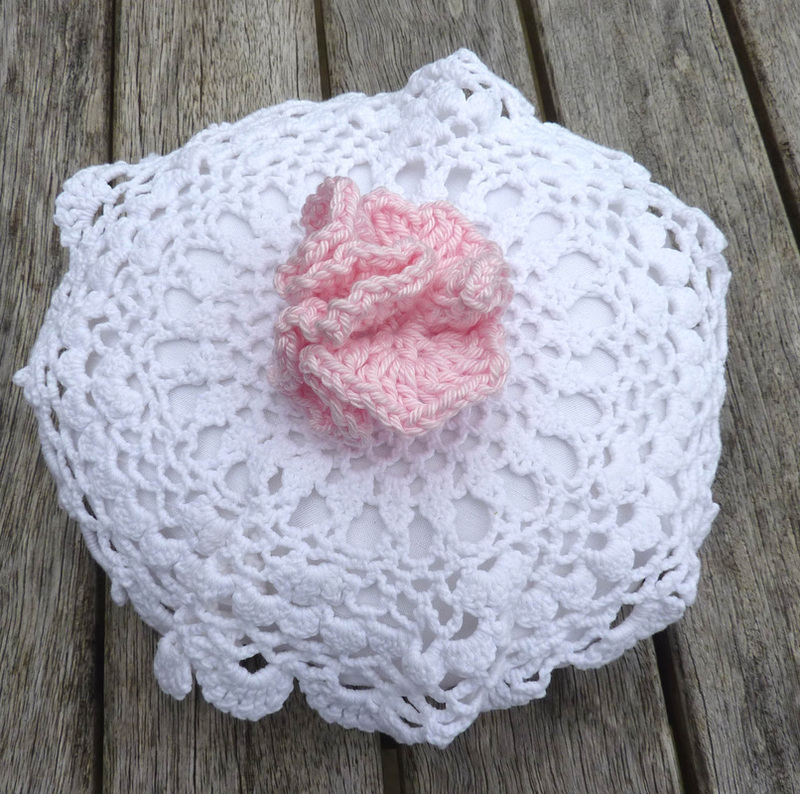 It would team beautifully with the pastel posy on the bouquets page. Underneath there are pink ribbons hanging down and these can have little porcelain hearts added which will 'tinkle' as they touch each other. 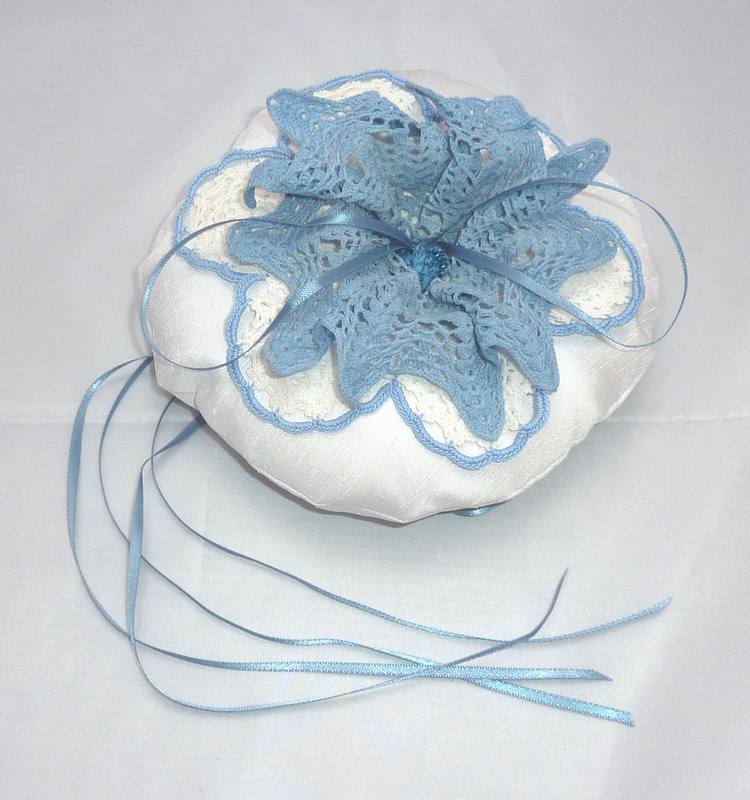 I have only two or three of these doilies, but can change the colour of the centre flowers and ribbons to suit and I can change the colour of the cushion itself. 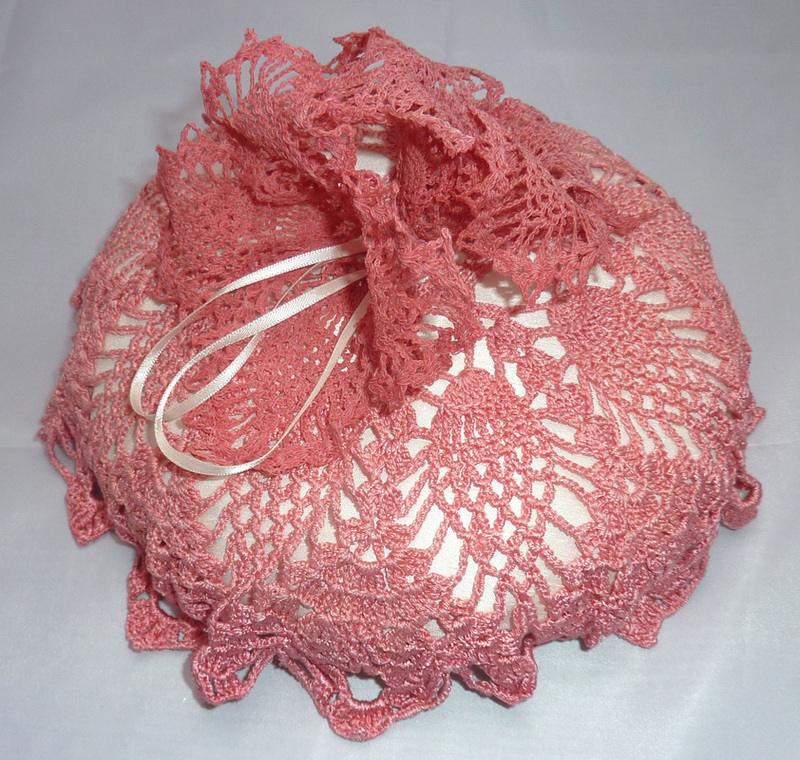 I do have a couple of these pretty coral coloured crocheted vintage doilies available but no more of the flowers which were made from vintage crocheted drinks mats and stiffened to make them hold their shape. It is one of my favourites, but did take a long time to make, so will be a rarity! Another vintage decorated ring pillow, this time with a pretty embroidered butterfly in the centre. 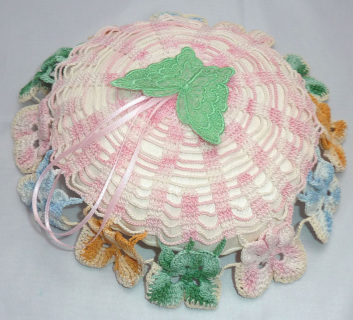 I could replace the butterfly with one in a different colour if you like but the doily is another one-off and I won't be able to repeat this. A flower could replace the butterfly if you prefer. 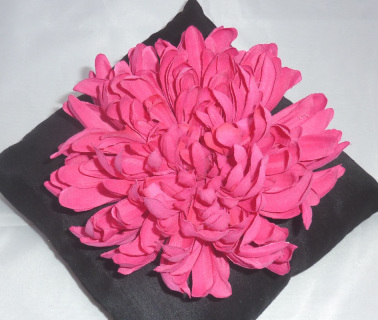 ring pillow - in the pink! You could chose a different combination of colours and this would look completely different! Basically this square black silk ring pillow is decorated with one enormous flower. It would look just wonderful if you were to have a bouquet like the 'pink poppy' design on the bouquets page. Certainly memorable! I have four of these flowers, and a few of the pink poppies in stock and could make a bouquet with this flower instead of the poppy, or put a poppy on the pillow if you wanted them totally teaming.